Bahraini authorities severely restrict civil liberties through an orchestrated campaign of unlawful arrests, revocation of citizenship, enforced disappearances, detention and torture of activists and journalists. This assault on civil society, which began following widespread peaceful demonstrations in 2011, continues despite recommendations made by a state-sponsored commission in 2011. Even though the Bahraini Constitution guarantees the freedom of association in Article 21, a 1989 Societies Law makes it illegal for any group to operate without a permit. The state specifies the scope of each organisation’s activity and CSOs are prohibited from operating outside of that strictly-defined mandate. Even though the Bahraini Constitution guarantees the freedom of association in Article 21, a 1989 Societies Law makes it illegal for any group to operate without a permit. The state specifies the scope of each organisation’s activity and CSOs are prohibited from operating outside of that strictly-defined mandate. Authorities also keep a close watch on civil society’s communication with external actors. Activists working in the field of democracy and human rights face particularly serious harassment by security forces. Some human rights organisations have been shut down or taken over by the authorities, forcing them to carry on their activities clandestinely, while others were refused registration in the first place. Such interference in the affairs of organisations is justified under the pretext of maintaining security and stability. The government has also placed several restrictions on receiving foreign funds and to do so prior approval from the relevant authorities is mandatory. 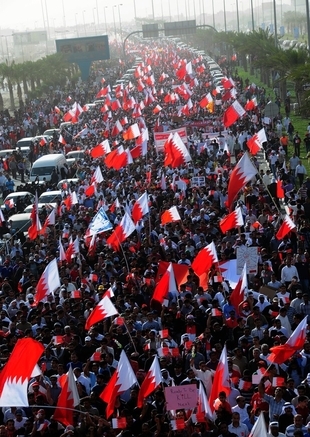 Public assemblies are banned by the authorities in Bahrain, although protests continue to take place in defiance of the authorities. Even though the right to gather peacefully is protected by Article 28 of the Bahraini Constitution, in practice assemblies are rarely authorised, forcing activists to gather without the protection of the law. Public assemblies are banned by the authorities in Bahrain, although protests continue to take place in defiance of the authorities. Even though the right to gather peacefully is protected by Article 28 of the Bahraini Constitution, in practice assemblies are rarely authorised, forcing activists to gather without the protection of the law. No gathering can take place near public buildings, and in no part of the capital, Manama. Protests that do occur are regularly met with excessive force and the arrest and torture of protest organisers and participants. Extrajudicial killings of protesters have also taken place. Despite the risks, protests continue on almost a daily basis in an attempt to draw attention to human rights abuses and to commemorate the peaceful uprising in 2011. The Bahraini Constitution provides very limited protection for the freedom of expression. According to the law, it is necessary for all publications to obtain government approval. Most media in Bahrain avoids criticism of the Monarchy, particularly following a legal amendment that increases punishment for insulting the King to between 2 and 7 years. The Bahraini Constitution provides very limited protection for the freedom of expression. According to the law, it is necessary for all publications to obtain government approval. Most media in Bahrain avoids criticism of the Monarchy, particularly following a legal amendment that increases punishment for insulting the King to between 2 and 7 years. Those that attempt to take an independent line risk being targeted or shut down. In August 2015, The UN Special Rapporteur on the promotion and protection of the right to freedom of opinion and expression wrote to the Bahraini authorities expressing his concern at the temporary suspension of Al Wasat, the only newspaper that takes an editorial line that is somewhat independent of the government. Individually, journalists are subject to serious harassment and similar treatment to that meted out to human rights activists. Although over 90% of people access the Internet, social media sites including Facebook and Twitter cannot be used freely, rather, online content is used to level charges against people and arrest them.